The Remote Controlled Slag Door allows safe, user friendly and eco-friendly operations. 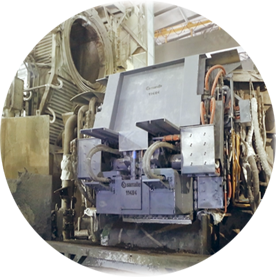 Strong equipment design and dimensioning to withstand the hardest conditions inside the furnace. Water cooled elements and/or externally coated for protection. Position control by means of linear position transducers. Equipment designed with easy accessibility for maintenance activities. Integrable in existing Hydraulic units.